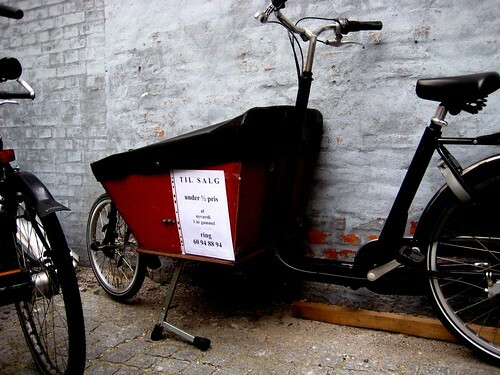 The Danish cargo bike market is a feisty affair. 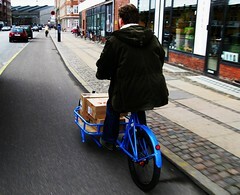 "Ladcykler", as they are called in Danish, are popular and practical. There are so many different brands all competing for the attention of city dwellers who use the bikes for transporting kids, groceries and basically everything else. Nihola, Esimex, Winther, Bellabike, Sorte Jernhest, Triobike, Christiania Bike, Long John, Short John, to name the main players. 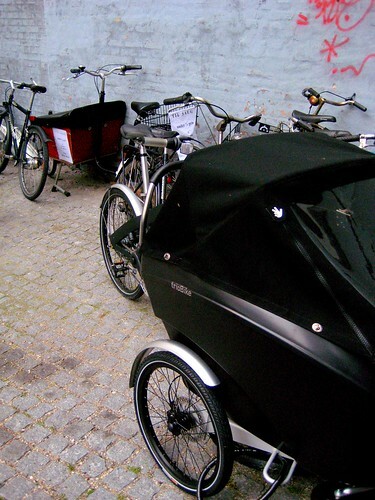 Above is a photo of the Mercedes of cargo bikes - The Triobike - shiny and black as a mare. In the background, a rare Dutch-made Bakfiets. For some reason, Danes prefer three-wheeled cargo bikes. With the exception of the Long John, you only really see three-wheeled trikes on the bike lanes. Cornering isn't an issue since nobody is out to break land speed records in cargo bikes. The pace is relaxed and casual, so cornering is hardly an issue. "For Sale. Under half-price of the new price. 1 year old." Now THAT is something you don't see around here. In my experience, Danish cargo bikes hold their value. You can't even get a ten-year old Christiania bike for under half-price of what they paid for it a decade ago. I'm not expert but such a crash in value after only one year surprises me. I don't know much about these Dutch-made bikes and you rarely see them on the streets here. But I do know it's a tough market to break into what with the Danish emphasis on design and quality. Triobike in its natural environment. The classic Danish Long John. Over 70 years old and still going strong.